BLACK SHEEP (D. Trimmer) Tetraploid Orange City x (Sdlg. x Open My Eyes) 36” EM Re. Ev. 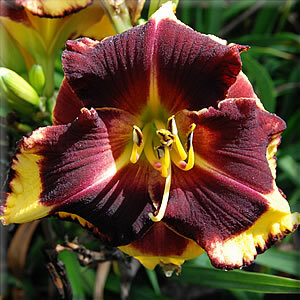 5 ½” This parchment colored bloom jumps out at you with its black plum eye and fine black plum edge. 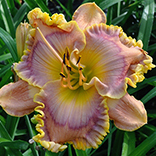 This great performing extremely pod fertile cultivar is an excellent parent and garden subject. Typical branching are two lateral branches, a terminal Y and about 20 buds. BLACK SHEEP was admired as Sdlg. 7-6.